Hilari Fleming of Reno, Nev. is a Ph.D, M.D., and one of only a handful of female neurosurgeons operating on the West Coast. She is also a three-time Great American/USDF Region 7 Dressage champion. 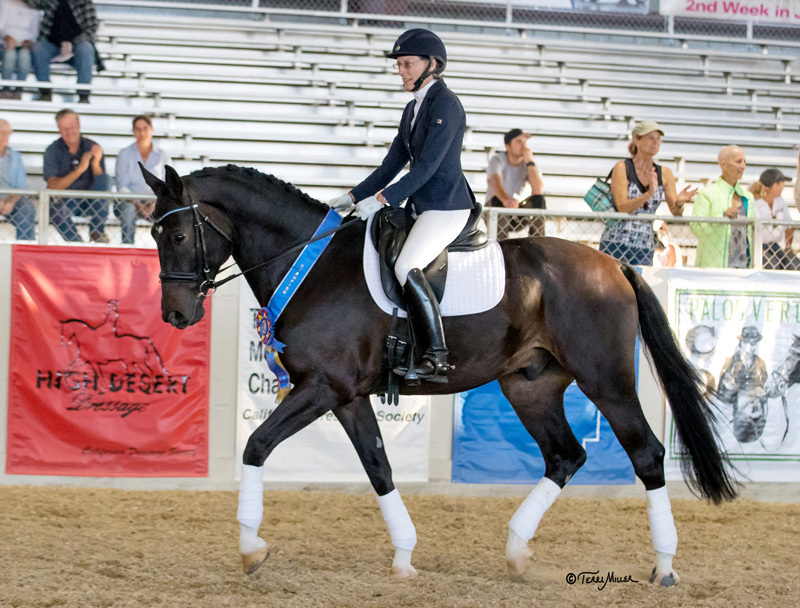 This year’s win, in the adult amateur training level with her 4-year-old In Time DG in Rancho Santa Fe, Calif., on Sept. 21-24 with a score of 73.29 percent, was a bit of starting over for Fleming, 61. She had developed another horse, Rubicon SF, to Intermediaire. On the way, they’d claimed AIG/USDF Region 7 championships at third and fourth level in 2011 and ‘13. She’d hoped to continue moving Rubicon up to Grand Prix, but she lost him due to colic. COTH: Can you tell us about In Time DG? Fleming: Tempo is a Dutch Warmblood by Ravel and out of Festival. I bought him in April of 2016 as an unstarted 3-year-old. He’s a pretty boy who’s a lovely mover and he also has a super disposition. He’s very bouncy, very springy, but he’s really comfortable to ride despite that. He’s overall a forward, willing horse and around the barn he’s a little bit of a clown. It was pretty obvious when we went to see him that he’s just a horse who’s comfortable in his own skin and is quite different than my other young horse, who’s on the hot side. I bought Tempo sort of quickly because I lost my Intermediare I horse, Rubicon SF, to colic. I wasn’t initially going to get such a young horse but I like the whole process. All of my horses have been purchased green-broke or lightly started because I enjoy the whole routine so much. COTH: What is your relationship with your trainer like? Fleming: I’ve been with Katy Hayworth for 15 years. I’d known her as a trainer for a while and I’d always liked her teaching so I tried it out and it worked very well for us. She’s good for me, she pushes me. She’s very flexible with my schedule and claims I always have the best excuses when it comes to canceling a lesson. COTH: How did you get started with horses? Fleming: I started taking lessons when I was 12 and did the hunter/jumper thing. Then my family moved East and I started with Pony Club and got into eventing. Somewhere in my 20s I realized I could break my neck, and dressage became more interesting at that point. I have a daughter and she got into the jumpers so I spent more time helping her until she went off to college, then I had time for my own riding again. COTH: How did you become a neurosurgeon? Fleming: I actually started out getting a Ph.D. in genetics and then decided that the people who had access to the most interesting research had the M.D. as well. I decided to go to medical school still thinking I was going to stay in research. I ended up in neurosurgery kind of as a fluke. I rotated through it and just fell in love with it. The nervous system is fascinating and I love seeing where lesions in the nervous system are and what they cause. COTH: How do you balance your work with riding? Fleming: I’ve been able to slow down a little at work. I specialize in brain tumors and I’ve not had to take ER calls in about 10 years so that makes life easier. When I was in residency I was showing very little, though I continued to ride. My colleagues are vaguely aware of my riding because my vacation schedule is entirely dictated by my show schedule, but they don’t really know specifics. COTH: Why have you stuck with dressage? Fleming: I think the same personality type that makes me a neurosurgeon appeals to dressage. I’m meticulous, focused and I’m definitely a perfectionist. Dressage requires attention to detail, focus and the willingness to keep striving for perfection even if you’ll never reach it. I want to get my USDF gold medal and get, like most dressage riders, get to Grand Prix. I like to bring my horses up the levels. It wouldn’t be the same to buy a horse that was already going Grand Prix and show it. The relationship is so strong with your own horses; they know you inside out and you know them. COTH: Why was this championship meaningful? Fleming: This is not the first regionals I’ve won, and it was bittersweet because it was supposed to be me and Rubicon this year. Rubicon was a great horse—I hope Tempo follows in his footsteps and him winning this championship is an encouraging sign. He and Rubicon are very different, but my trainer jokes that when you lose a horse it picks the next horse for you. I think that’s actually true because we were driving back from looking at Tempo and trying to arrange a vet check and I realized it was Rubicon’s birthday. Two months after I had him I told Kathy she was right, Rubicon picked Tempo because he found the only horse who was more of a pig in his stall than Rubicon! But Rubicon was grey, so at least I have a bay pig now. If you’ve enjoyed this information from Sierra Neurosurgery Group and think your friends or family might benefit, please click below to share.